So, did you come up with some questions for your Higher Self? Did you receive some answers? Do you feel you are becoming more sensitive to higher contact? The answers will vary depending on the individual. The important thing at this point is to keep moving forward. To move forward it is important to continue with the exercises already given as well as continue seeking new ways to break through. In this material world we have five senses through which we perceive information. As you know, these are vision, hearing, feeling, taste and smell. Less known is that we have a higher correspondent to these in the spiritual world. The Higher Self understands our physical senses, but has a higher octave of them that It uses within its own sphere and is willing to share with you. The higher correspondent to vision is understanding and spiritual sight, higher to hearing is discerning the still small voice or impressions from the soul. Above feeling is the ability to sense the presence of spiritual beings and forces. Corresponding to taste is the power to discern truth from error and the higher sense to smell is the power of intuition giving the seeker power of revelation and the bringing down to brain consciousness true spiritual principles. Today we are going to concentrate on your sense of feeling. We often take our feeling sense for granted, as its presence is universal throughout the body from head to toe. Our feelings and touch allow us to verify the existence and texture of the things we see and hear. They tell us when to eat and drink, when something is wrong with the body that needs attention and many other things. Most associate our feelings with things touched in the physical world, but the higher sense of feeling is capable of ascending much higher. There are signs of this even with using the normal sense of feeling. If someone else is available have him or her run his hand over various parts of your body while having your eyes closed. Have this person not touch you but stay just an inch or so away from actual physical contact. Can you sense the person’s presence? Most likely you can. If no one is available do it to yourself, starting at the crown of your head and moving your hands down over various parts of your body, not touching yourself, but keeping your hands an inch or two away from the skin. You will notice that you can feel the presence of your hands even though they do not make contact. You will notice that some parts of your body are more sensitive to feeling than others. Now, let us expand this sense of feeling to include your higher spiritual sense and feel the presence of your own soul. Its presence is never far from you, but only obscured though the illusive veils that physical existence places between us and the spiritual realm. For this exercise do not concentrate on seeing or hearing anything, but merely feeling the presence of your Higher Self. Sit back in your chair, close your eyes and call out the name you have given to your Higher Self. Call out the name, sit back and for a minute or so concentrate on feeling the presence. Realize that this presence will have a high vibration, and is surrounded by a spiritual fire that reaches out and surrounds you. Repeat this two additional times while sensing the presence and the comforting yet spiritual fire connected with it. After you call out the name for the third time focus on not only feeling the presence, but being one with it. Feel yourself merging so you become one mind and one entity. If you do this successfully it will feel very familiar, as if you have returned to your true home. Continue this extension of your feeling for your soul for 15 minutes or so. Repeat this exercise whenever you feel so impressed. So, how did you do at tuning into the spiritual sense of feeling and sensing your Higher Self? Students will receive a wide range of response on this, but all who sincerely tried this will have perceived that there are spiritual beings and forces that can be sensed if one focuses long enough to tune into them. Today we will concentrate on the spiritual sense of hearing. Hearing is an important sense in our physical realm. It allows us to communicate with each other face to face. We not only hear the words that are spoken, but we hear the tone of voice or the way the speech is given out. Sometimes the emphasis placed on words reveal more than the words themselves. All of our electronics necessitates hearing for full use. We use hearing regularly with our televisions and mobile devices. A walk amidst nature is greatly enhanced by hearing. It is pleasant to listen to the birds, the animals, crickets, the rustling of wind, a gentle rain or to be reminded of natures power in a display of thunder and lightening. Indeed, physical hearing enhances our life experience. If this is the case then imagine what spiritual hearing will do, for the power of the higher always exceeds that of the lower. As stated earlier, higher spiritual hearing involves the still small voice and impression. That which we call the still small voice is itself transmitted by impression, as the seeker does not hear words in the normal sense, but instead they form in his mind in complete physical silence. We call it a voice when the impression comes clearly enough to be translatable into words. Sometimes spiritual hearing will be so clear that exact words will form in the mind. Other times the seeker will clearly sense the impression, but will need to put it in his own words. At still other times the impression will be vague and the seeker will not be sure if his imagination is playing tricks on him or if he is really receiving something. In this case he needs to focus on paying attention. The assignment today is to concentrate on hearing what your own soul, or Higher Self has to say to you. First sit back and call out the name you have given to your Higher Self and repeat yesterday’s lesson of feeling the presence. Sensing the presence should come quicker this time. Keep in mind that the answer could refer to your physical, emotional, mental or spiritual self. The first time you ask this you will most likely get some type of impression, but will not be sure if it comes from your soul or your imagination. Clear your mind and ask again and then again and follow up with additional questions of your own making. As the answer by impression becomes stronger you will become more confident. Do not be concerned if you are not confident in your answer at first. You are entering new territory and it takes time to master any skill including this one. The more you practice the greater will be your accuracy. Did you receive a clear answer on this? Probably not at first, but also remember that your first impression, however faint or even illogical, is not to be dismissed. The first impression is not always right, but it often contains clues to the real answer. When you ask a question you must be aware of the various answers that could be given. For instance the question includes the word “healing.” Did this cause you to focus on physical healing? The seeker should realize that healing extends far beyond the physical. In fact, most physical maladies are merely a manifestation of non physical problems sending a message through the physical body. The emotional self creates many problems though harboring a grievance or perpetuating some state of denial. The mind can cause problems by nourishing a deceptive illusion that sends distorted energy down through the emotions and then to manifest as physical problems. So where do you need to focus the healing powers of the soul? Should they be just on that pain in the neck, or maybe it is your reaction to the situation or the person who is a symbolic pain in the neck. For every problem where illness or discomfort manifests there is a possible healing. Sometimes we cannot find it on our own and need a little help from a higher spiritual intelligence. The next spiritual sense to examine is that of sight. We have already taken sight a couple steps beyond normal seeing. We have covered seeing the etheric body and the aura. We have also covered the art of seeing the Higher Self through the use of the imagination. Not many are sensitive enough to actually see the spiritual world, but many can sense the Higher Self that resides in it. The seeker can create a vehicle for the Higher Self through the use of his imagination, but then he can take his vision to a still higher level. An important aspect of spiritual vision is understanding. Understanding comes through spiritual light that interplays between the two worlds with the result of bringing light to the mortal mind. What most people call understanding often involves very little real understanding, but merely the learning or memorization of how something works. Understanding goes beyond the facts to seeing how the facts relate and support true principles. Sense the presence of your Higher Self a few feet in front of you. Now feel the presence come close to you,. Stand up as if you are face to face with it. Now feel it step forward and enter your body. Next sense you and your Higher Self as being one and that you can see through It’s eyes of understanding. Using this enhanced vision examine your life from the time you were born to the present. See your life as your Higher Self sees it. Spend whatever time is confortable examining your life and see what insights come. When you are through see your Higher Self step out of your body but a lighted link joins you so Its presence is closer now than before. So, were you able to merge with your Higher Self and look upon your life through Its eyes. Or maybe I should ask if you were able to imagine merging with it and seeing through Its eyes. Let us hope you at least made the effort. Remember energy follows thought and the more thought you use to imagine these things the more energy is drawn to them. When enough energy is available you will have created an actual vehicle in which your Higher Self can manifest. Of course, there are degrees of manifestation and the higher the intensity of thought the greater will be your power to be one with your Higher Self and share in Its understanding. Did you attempt to look upon your life through the eyes of your Higher Self? If you did this successfully it would have been like a life review – not as complete as you will receive after death, but a foreshadowing of it. A life review done here in the midst of life is quite valuable as you still have time to use the knowledge and make corrections. Socrates said that “an unexamined life is not worth living.” Therefore, let us attempt to examine ourselves frequently and learn from the lessons life has for us. The next sense to consider is that of taste. Its higher correspondence is that of discernment. 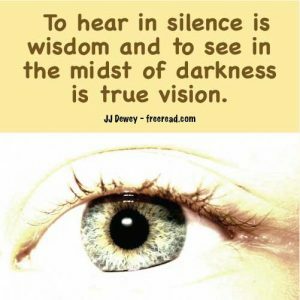 The wise use discernment to see the difference between truth and error, good and evil and other dualities. He correctly sees the dualities and the zero point between and discerns which side of the duality takes us toward the dominating good and why this is the case. Many used their material filters and see the dualities upside down from their true condition. The ancient sages thus complained that people get things backwards to the extent that they cannot tell what is good and what is evil. They are so incompetent at this that none were said to even know how to do that which is the true good. It is unlikely the prophets were speaking of some of the basics such as lying or stealing which most acknowledge to be evil, but were looking at the big picture. When one puts all the pieces together are we seeing the true good or the true evil? For instance, Hitler spoke of many virtues that most would call good, but the whole picture he put together was not so good, yet accepted by most of the German people at the time. We have the same problem today, Leaders on both sides of issues speak of virtues that most consider good, yet if the whole agenda is discerned we may find that this person could lead us to destruction. True discernment doesn’t just look at individual parts or ingredients of a plan or goal, but closely examines the whole thing to determine its worth. Without the help of the soul the seeker will make errors in discernment and sometimes will examine that which is good and call it evil and look at evil and call it good. Not everything that sounds good on the surface is good and many things that are called evil belong to the higher path. The biggest problem we have today with bad discernment are the powerful political divisions we see developing throughout the world. Both sides are pointing fingers, calling each other evil and those looking for the true good are rare. There is good to be discerned on the liberal side and the conservative and true union is to be found when all the good is discerned and synthesized into a working while. Your assignment today is to call upon your soul and look through Its mind at the main political side you least support and find three things that are good within the belief system. Your assignment was to examine the political side you least support and find three good things in it. The two main political divisions are the conservative and the liberal. If you normally side with the liberals you should have looked for good within the conservatives and if you normally side with the conservatives you needed to look for good within the liberal view. How did it go? Were you able to find three good things or did you conclude that at this juncture the other party is so far off that there is nothing good to be found in them? Those who arrived at this conclusion need to take another look, not through the eyes of the personality, but through the soul. We must realize that no party is 100% liberal or conservative but the major parties in the various countries always lean one way or the other. That said, I will name three positive things from each side. See if they are in harmony with what you came up with. Keep in mind you may have named some good ones not on my list. (1) Things that have been proven as positive for society need to be conserved. For instance, respect for just law and order helps keep a society intact and healthy. (2) Conservatives tend to reject bad ideas for liberal change causing the change that does occur to be more effective. (3) They place needed emphasis on being fiscally responsible, something needed when we are $20 trillion in debt. (1) There are many things that need changed for the better and liberals are always putting forth their ideas for change. They keep us from resting on the status quo. (2) Liberals, as a whole, are more creative than conservatives and provide us with stimulating entertainment. (3) Sometimes (not always) rules need to be broken and liberals are more willing to take a chance and do this when needed. For most it is much easier to point fingers and condemn the other side, but many of the flaws the two sides see in each other are found in both of them. Unfortunately, many ideologues are so polarized that they can find little if any good in those with opposing political views. This should not be the attitude of the seeker of truth for in the higher realms of Spirit good is seen in all who have any desire to do what is right. Politics is where discernment is most needed in the world today, but there are many other areas where the seeker can practice this ability. Now let us move on to the fifth sense, that of smell. The higher correspondence of this is the intuition. Smell is an amazing sense when you think of it. When you smell a flower from about foot away can you imagine the small number of particles that enter through your nose to create the smell? Or someone could be cooking bacon 100 feet away and yet enough tiny molecules enter your nose arouse your hunger. Then when we consider that a dog’s sense of smell is, on the average, 40 times that of a human one can only stand in awe at this marvelous sense. Just as the sense of smell can seemingly pick up information out of thin air from nothing visible the intuition can reach into the invisible realm of Spirit and retrieve information and principles. Just as it was difficult for humanity to figure out how the sense of smell works many humans do not understand intuition. Many confuse it with a gut feeling or with clever reasoning ability of the mind. Intuition, as your Higher Self understands it, is much more than this. If the seeker taps into the intuition he accesses a spiritual Internet where all true principles can be understood. We’ll talk more about the intuition in the next lesson but for your assignment sit back, closed our eyes and focus your attention in your forehead, the seat of the your intuitive powers. In the center of your forehead see a growing ball of light and then in the midst of that light see a friend or family member who has political views different than your own. See him as a brother or sister struggling to find his way in life just as you are. See him as having a Higher Self just as you do. See that your Higher Self loves this person’s Higher Self and sense the love connecting you with him. Just as the sense of smell brings to the attention of brain consciousness scents by invisible and almost miraculous means, the intuition accesses a higher plane, perceives the invisible and brings it to our awareness. The power of the intuition must be accessed through the medium of the Higher Self. The highest we can access on our own is the higher part of our minds. The higher part of the mind can access the soul and the soul can access the higher planes. The goal of the seeker is thus to become one with the soul which will give him continual access to the intuitive plane. The intuition gives the seeker access to the plane wherein ideas originate. These ideas are founded on true principles which are clearly seen through the eyes of the soul accessing intuition. Ideas exist on two levels here on the earth plane. Most of what we call ideas are merely formed by the mind making various associations of thought. Thought one plus thought two equals thought three, often seen as an idea. An idea brought down by the intuition is more of a revelation than a deduction. In bringing down an idea through the intuition the seeker may use some associated thoughts but the revelation will be more than 1+1=2 type of thinking. The idea will come in a flash and will be beyond the power of the mind alone to produce. The intuition may also verify ideas and principles already taught here on the material plane. It doesn’t create a fiery confirmation as sometimes happens in spiritual experiences. Instead it just turns on an inner light giving the seeker a knowing and understanding about the principle or idea involved. I have often written that the language of the soul is the language of principles. A principle can reveal a thousand facts, but it may take a thousand facts to relate the fullness of a principle to the average mind. When the seeker accesses the power of the intuition through the soul he can sometimes grasp a picture of truth in an instant that may take a book to explain if he were to write it. There is no single exercise that can be given that will cause the seeker to make a breakthrough in accessing intuition. What he must do is to seek additional soul contact and as he progresses toward a fullness the intuition will naturally develop. For the assignment today I will give an affirmation on which to contemplate. Within the depth of these words are potential intuitive flashes that can reveal true principles. No great revelation may come today, but if the seeker continues all knowledge of truth will be his. It will come in its own time. Hopefully you placed some attention on the intuition as brought up in the last lesson. There is no easy way to teach it. Getting hold of it with the mind is like trying to grab a dust particle floating in a beam of light shining through a window. The harder you try the faster it moves away from you. The seeker can take heart though that when he successfully treads the path and follows the step by step approach to soul contact that the intuition will be naturally enhanced. When he is finally one with the Higher Self he can access the same intuitive knowledge that It does. The Higher Self has many powers that are not normally accessed by regular humanity, but can be. It has great creative powers and used these powers to assist in creating your body and then projecting a fragment of its consciousness into it. That fragment is you. Some time after your death you will reunite with your Higher Self and it will be like awakening from a dream. Then later on you will dream again. The Higher Self is capable of placing several fragments of itself on earth at one time. Normally, it just has one fragment on the earth, but there could be two of you if it fulfilled some purposed. This has been verified by the late Michael Newton, who through regressive techniques took thousands of people back to their life between lives and received very consistent accounts. The fact that your Higher Self can project more than one fragment of itself on the earth plane at one time is valuable information to have. Seekers utilized this knowledge when they named their Higher Self and then imagined its presence. Just as your body is a vehicle for a fragment so are thoughtforms created by your mind. If you place enough energy into visualizing your Higher Self then a body of mental matter will be created as a vehicle for It to use. Because thought matter is more refined than physical matter It can communicate through it with less distortion. One of the ways the soul can manifest a greater portion of itself to us is through the use of the Master Mind. The Master Mind idea was made popular by Napoleon Hill. He discovered there was great power in its application but didn’t seem to be aware of why this was so, but did realize that some divine power was at work. He discovered that two or more people working in harmony toward a goal seemed to draw to themselves, not only more power than they have as individuals, but that the whole was equal to more than the sum of the parts. He found that individuals in a united group had an almost supernatural ability to access each others talents, mind power and more. The larger the number that was united the more potent the group became. The reason the Master Mind works is because souls in the spiritual world can see eye to eye much more effectively than do people on the earth plane. When two or more unite with a positive purpose they are following the path of the soul and bring down additional soul energy that can be felt and accessed by two or more people here. The union of souls through a Master Mind is one of the most effective ways to increase soul presence that can be accessed and used by the seeker. Your assignment today is to first pick a goal that you would like to see accomplished. Next reflect on all the people you know and pick two or three that would most likely support you in reaching this goal. It is advantageous to have them within the range of physical contact, but not essential. Next imagine that they are standing in front of you, willing to assist you. After this tell them either vocally or with your thoughts what your goal is and ask for their support, advice and help in achieving it. Now look at them and imagine what response they give to you. If you succeed in doing this with soul energy the advice you sense will be in harmony with your soul. Spend as much time as is confortable imagining interplay with your Master Mind group. How’d the last lesson go? Did you visualize your friends in your Master Mind group? Were you able to see any of them in the flesh? There’s nothing like s haring thoughts in person. Actually all people use the power of the Master Mind to a degree through their relationships with their innermost circle of friends, which would include the spouse. Normally when a person gets an idea, or considers a new goal the first thing he will do is visit one or two close associates and share thoughts with them so see what they think. Usually they will have some advice and input. Once received the guy will often alter some of his planning making his ideas more practical. Just discussing with friends brings down more soul energy, but the interplay seems so natural that the principle involved is overlooked and only a small portion of the possible potency is achieved. Once the seeker realizes how group cooperation can manifest additional soul energy and intelligence he can create a Master Mind and take his thinking to new levels. Napoleon Hill wrote about how many successful people created a Master Mind composed of people in their enterprise. By holding meetings with them they were able to draw down intelligence that surpassed any of them individually. He imagined their presence as a council and used them for advice as well as incorporating their positive qualities into his life. As time passed they became so real that he became concerned and decided to discontinue the idea. Then something quite unusual happened. This startled him and he immediately resumed his Master Mind group and continued to develop his philosophy. In fact he expanded his group to include more than fifty famous people more, among them were Christ, St. Paul, Galileo, Copernicus, Aristotle, Plato, Socrates, Homer, Voltaire, Bruno, Spinoza, Drummond, Kant, Schopenhauer, Newton, Confucius, Elbert Hubbard, Brann, Ingersol, Wilson, and William James. In the end, I am sure that Lincoln was proud of Mr. Hill for he wrote many books that inspired millions, including myself. Napoleon Hill realized that the Master Mind group had supernatural powers that somehow originated through Divine Intelligence, but was not clear on how it worked. He just knew that it achieved results. Understanding how it works will give the seeker more power to use the principles involved. The Master Mind works through the individual focusing on the higher mind and linking with his Higher Self. The Higher Self then has power to send a fragment of consciousness into any thoughtform you create. What is interesting is that your soul can access the consciousness of any other soul, living or dead. This was why Hill’s Lincoln was so real. His Higher Self accessed the consciousness of the real Lincoln which allowed him to interplay with an image that manifested the personality and intelligence of the real Lincoln as he existed in the 1860’s. Today’s assignment is optional. While you should have a Master Mind group of at least several close friends and associates, an imaginary group of famous people from the past is optional. If you do decide to create such a group it will require considerable effort and time, but the benefits could be quite amazing. Whether you make the effort or not at least think of three famous people that you admire. Bring one or more of these into your consciousness now and then and consider what advice they would have for you or what they would do in your situation. Continue working with your Master Mind of living associates, both in person when possible, and by using your imagination. We have covered the correspondences to the five acknowledged senses, but there is a sixth one, and it is not ESP. What is called ESP is not connected to the physical senses but belong to the astral body or higher correspondence to them in the soul that we have recently covered to some degree. A sixth sense related to the physical body is a sense of balance. This is a very important one for without it you could not even stand upright or walk. We witness many people who have highly developed this sense such a surfers, tight rope walkers, and mountain climbers. All who excel at sports have a well developed sense of balance and all of us use this to some degree. So, what would be the higher correspondence to balance? How would this manifest through the Higher Self? This sixth sense manifests in a wonderful way in the kingdom of the soul. The Higher Self puts reality in is proper perspective so it maintains a balance of spiritual energies giving it a powerful sense of peace. The “peace that passes all understanding” is the sixth sense of the soul. The correspondence is interesting. When a person feels out of balance or out of sorts he also does not feel at peace. When we extend our sense of balance to giving the right amount if attention to the essentials of life and balancing them with the inward sense of right and wrong we then can be at some degree of peace with ourselves. If the person neglects his family, friends and spiritual values for material success he will be out of balance and not have that peace that every life desires. The peace of the soul is on a higher level than regular peace as seen by average humanity. Even most of them who live a fairly balanced life will discover that they are lacking the flow of spiritual energies to counterbalance the excess of material ones that we have on the earth plane. It is impossible to achieve the peace of the soul on our own. To do this the seeker must seek contact and then share in this balancing of all the energies that are accessed. One sign that a person has achieved soul contact will be that he will have experienced a transcendent peace that goes beyond anything related to the material world. As you contemplate you may realize that there are several things that are in the way such as some residual guilt, a grievance, worry or just being too caught up in daily problems. This course has covered guilt and grievances. If they are still a problem then review those lessons dealing with them. Other distractions will be drowned out if the seeker can access the peace of the soul. Use the following affirmation and quietly mediate on it, expecting results. So you thought that there were just five senses here on the material plane, but were presented with a sixth which was balance. When you thought about it, it did indeed seem to qualify for a sense. You probably did not expect another sense to be presented, but should not be surprised, as all creation manifests in sevens. The seventh sense is timing and is related to the brain which is linked to the mind and heart. A sense of timing manifests in many different places of our lives. This good sense often separates the nerds from the popular ones in school. The nerd may have developed the part of his brain that allows him to get good grades, but may lack the sense of timing had by the popular kid just getting by with Cs. Timing isn’t the same as what is commonly called emotional intelligence, but is enhanced by it. The guy with good timing gets the girl because he initiates a series of events that work in his favor. The guy with bad timing approaches at the wrong time, says the wrong thing and reacts in a way that makes others cringe. We see that the sense of vision is different for each individual. Some require glasses and others do not. Of those who require glasses many different prescriptions are needed. A sense of timing is like that. Some have a good sense for it and others need timing glasses to make up for a deficiency in that sense. Let us say you are at a party and you observe a group of six having a conversation about football. Four of them are really into the game and their conversation seems to fit in. The fifth guy doesn’t follow the game much, but has a good sense of timing so he just nods his head and asks a few questions at the appropriate time. The sense of timing manifests in many aeas of our lives. When you were a kid you learned to time just the right moment to ask a favor of your parents, or maybe just the right moment to cry or throw a fit to get what you want. During the teenage years most concentrate on good timing in relationships and seeking popularity. Later when seeking employment you use a sense of timing to select your career, and in your work you use good timing to get ahead and fit in. Timing is related to cycles. There are cycles where the door of opportunity is open and others where it is closed. The one with a good sense of timing has a natural grasp of numerous cycles in life and instinctively knows when the opportunity is there and when it is not. The last assignment asked the question of how the seventh sense of timing manifests through the soul. This is manifest through the power of judgment. Here Jesus is NOT telling us that we cannot judge, but is instead warning us of the law of karma if we judge harshly or incorrectly, for he says: “with what measure ye mete, it shall be measured to you again.” Therefore, if you judge someone with minor faults to have major faults, this harsh judgment will come back to haunt you. In this scripture He gives the key for righteous judgment: “ﬁrst cast out the beam out of thine own eye; and then shalt thou see clearly to cast out the mote out of thy brother’s eye.” In other words, concentrate on eliminating your own faults ﬁrst, and then you will be able to make a correct judgment as to how to help your brother (or sister). Judge with clarity wisdom and love, and when you do this and later judged, as you have judged, all will be well with you, but if you do not judge righteously, then the law of karma will bring painful judgments to your door. When you think of it, it is silly to say we should not judge. As soon as you wake in the morning you make a judgment as to whether to get up or sleep a while longer. When you get in the shower you make a judgment as to when you are clean enough to get out. When you eat breakfast you make a judgment as to what you will have and how much. When you drive to work and are a little late you make a judgment as to whether you are going to speed or not. Finally you get to work and meet the new guy who was just hired. He wants to be your best friend and now you make a judgment on whether or not you want this type of personality in your life. Then your boss wants you to dig up some dirt on the boss above him. You judge your boss to be wrong and refuse. We could go on and on here, but hopefully we get the point. Judgments are not wrong. Only wrong judgments are wrong. Every quality and ability has a positive and negative side to it. When the Bible and A Course in Miracles talks about judgment in a negative light, they are talking about negative, limiting judgments. Example: The child received some bad grades in school and tells the parent he is going to do better next time. The parent responds: “You’ve failed miserably in the past, so you’re going to fail again.” This is a cruel and limiting judgment. A positive judgment would be something like this: “I have seen you make progress in the past when you make an effort and I do believe you have it in you to dramatically improve your grades.” Here the parent made a judgment on the positive possibilities of the child, and in this case judgment is a good thing. Like all other qualities judgment manifests in a duality. Limiting judgments are negative and should be avoided. Positive and constructive judgments can be very good and uplifting. The seeker needs to avoid judgments that limit, condemn, belittle and emphasize the flaws of others. The assignment today is to contemplate how judgment is used in this world and then how it may be used by the Higher Self in the world of Spirit. How does the soul use this seventh sense and how can we benefit from its judgments? The assignment was to contemplate the difference in the use of judgment between the higher and lower self, or perhaps we should say the material and the spiritual world. In this world a large part of the focus of judgment is on the negative aspect and this focus is so strong and prevalent that many on the spiritual path have seen judgments as some thing altogether bad and have just flat out condemned it. But as we pointed out in the last lesson there is a positive side to judgment. Judgment and decision go and in hand. Who would ever say that we should cease making decisions? No one. Ye before any wise decision is made the power of judgment must be called into play. The positive aspect of judgment is so powerful that it is is often associated with the wisdom of God and divine power. Unfortunately, the negative aspect is the opposite and associated with destructive thinking. In this world we see too much of the negative aspect with humans first judging and then being overly critical of their fellow men and women. Also, the inflated ego judges through a veil of illusion and sees his importance as being elevated above others. The ego may not admit it but but sees itself as superior to others and judges others to be inferior in every possible way. In the world of souls the Higher Self does not use negative judgment at all, but only uses the positive aspect. It does not think in terms of interior of superior, even though some souls are further along the path than others. It sees all life as being linked together and being interdependent. Your soul knows your complete history and planned your course in life and the major lessons you were to learn before you were born. It made these plans while linked to Divine Intelligence and made many judgments about how your life could proceed so you could obtain maximum benefit from each fork in the road. Your soul never approaches you from the aspect of condemning judgment but always seeks to help and even sees your mistakes as learning experiences. Every judgment hat It attempts to send to you is one that will help you to advance into the light and fill your heart with joy. The important thing for the seeker to do is to tune in to the world of Spirit, access the mind of his Higher Self and make judgments from Its level of vision. Thus your assignment today is to sit back, imagine the presence of your Higher Self manifesting and seeing though Its eyes as to the what lies in the path ahead for you. Also look through Its eyes at your friends and associates and see them using only positive judgment. See the Christ in even the most difficult people. To read previous lessons click on the links.